An unidentified man was attacked by five male suspects at 16th and Mission Streets around 3 a.m. Friday morning, August 1st. According to police, the suspects took the man’s cellphone and cash, and stabbed the guy in the leg before fleeing the scene. The victim was taken to the hospital and was in stable condition as of Friday evening, but police had not yet made any arrests in the case. Meanwhile, across town in North Beach, two guys and a dog also got stabbed around 1:30 a.m. Friday morning. The dog is expected to survive. Plaza 16 Coalition could not be reached for comment. Clean it up! 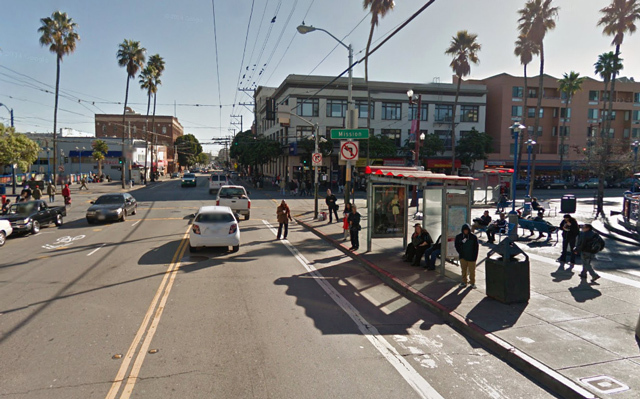 more complaining about how dudes riding buses to work at jobs is ruining the mission, less complaining about people getting stabbed and shot on this corner every week. That one work for ya?